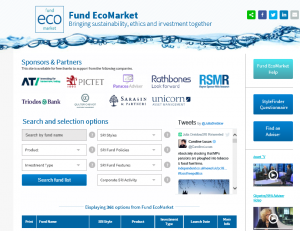 We are currently in the process of reviewing the SRI /ethical selection filters on www.FundEcoMarket.co.uk – ahead of updating our fund research very soon. We welcome your suggestions for updating the SRI specific filter options. The aim of this (free to use) fund information hub is to help raise awareness of the options that are available to UK investors with an interest in ethical, social and environmental issues. It’s audience is mainly (but by no means exclusively) financial advisers – many of whom may not research this area often. We do however want this to remain as useful and relevant as possible! So – if there are any important additions you would find useful for us to add please get in touch. At present Fund EcoMarket offers the ability to identify ‘potentially appropriate’ sustainable, responsible and ethical investment (regulated, retail and manly onshore) options through a number of filters. If you share our view that it is hugely important to help people find investment options that meet their personal ethical, social and environmental aims for all or some of these funds please check out what we do and let me know if you’d like to see any changes! ps – Fracking is already on the update list!